I will be honest. I do not expect you to use the crochet Loop Stitch everyday. Once you get the hang of it, this stitch becomes quite easy, but it is slow going. That said this stitch is very unique and will give your project a creative touch. The loop stitch is exactly what is sounds like. It is a Single Crochet with a 1 inch loop sticking out one side. You can easily swap this stitch out with any Single Crochet of Half Double crochet to add texture to a project. 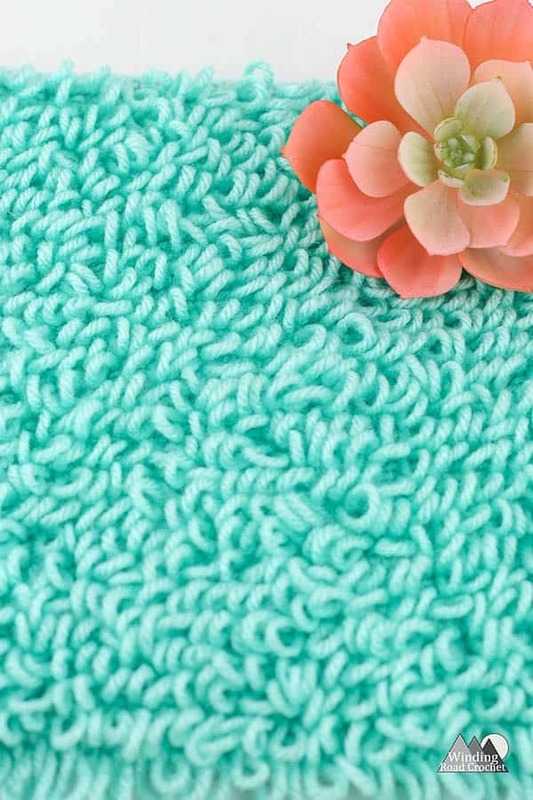 Where can you use the loop stitch? How about using it for grass or fluffy clouds in a graphgan (afghan made with a graph). Make a play mat for kids with a large swatch of Loop stitches as grass, water or anything else. I use the medium swatch pattern of this stitch found below for a page for my Baby Sensory Book. This is one of those stitches that are best shown how to do. The loop is going to be made on the back of your work. In the last two photos, I do not show it, but I leave my finger in the loop until the loop stitch is completely made, then remove my finger. I find that waiting until the stitch is completely made will give me more even sized loops. Large (Blanket) 12 inch Swatch we will chain 47. Medium (Book) 8 inch Swatch we will chain 28. Ch 17, 28, or 47 depending on the size sample swatch you would like to make. R2-? : Ch1, turn, Sc in the first st, Work a loop stitch into each stitch until the last st. Sc in the last stitch. You will continue repeating Rows 1 and 2 until your project is as big as you would like it to be. For the 12 inch square work until you have a total of 54 rows. For the 4 inch square work until you have a total of 16 rows.